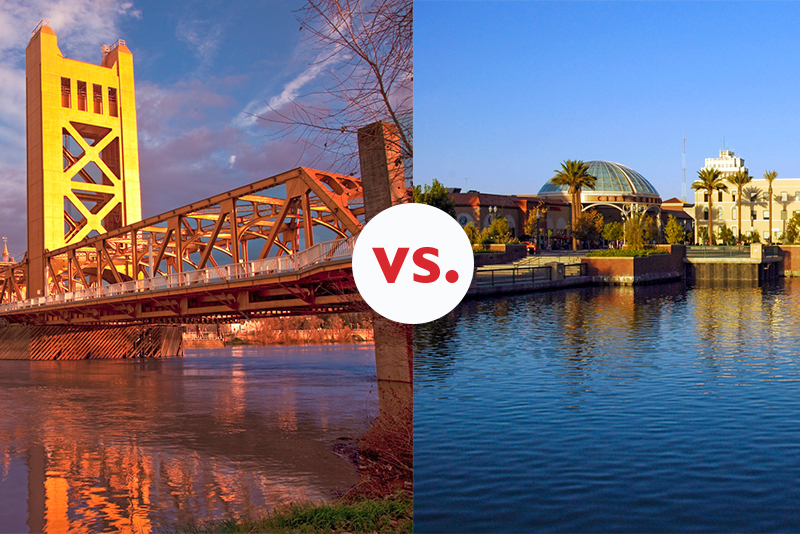 Sacramento vs. Stockton: Which California City Is for You? These California Central Valley cities have a similar climate and tax situation, but there are some unique options for what active adults desire in retirement. Located about 50 miles apart, Sacramento and Stockton are top retirement destinations in California’s Central Valley. Active adults are drawn to the region’s warm climate, access to outdoor recreation, and ideal location near California’s wine country. While these cities are pretty evenly matched, our quick guide will help you narrow down your choices when considering Stockton or Sacramento for retirement. California’s Central Valley region in general enjoys a Mediterranean climate. In terms of weather, Stockton and Sacramento are very similar. Residents living in this region can expect dry, hot summers and mild winters. With a yearly average of only 16-20 inches of rain, it’s easy to live a low-maintenance lifestyle here, especially in terms of exterior home upkeep. The average high during summer is in the low 90s and the average winter low tends to be in the high 30s. As with many other California cities, Stockton and Sacramento have plenty of sunshine all year long. Both cities are great options for buyers seeking a warm destination without extreme temperatures. Although it can occasionally reach the triple digits during the middle of summer, these temperatures don’t last the entire season. With an ideal location between the Bay Area and the Sierra Nevada mountains, both Sacramento and Stockton offer an abundance of outdoor recreation. Stockton is only about a two-hour drive from Yosemite National Park, one of California’s most visited outdoor recreation spots. Sacramento residents can reach Yosemite in just under three hours. This popular national park boasts 1,200 square miles of vast wilderness that includes meadows, glaciated landscapes, giant sequoia trees, and more. Other popular outdoor recreation spots include the Stanislaus National Forest, which is about two hours from Stockton and three hours from Sacramento. The Stanislaus National Forest is a great place to spend the weekend in a cozy cabin, go fishing at beautiful lakes, or admire the mountain landscapes while hiking. During winter, many locals who live in Stockton and Sacramento head up to Tahoe for a weekend enjoying the slopes at world-class ski resorts. When summer approaches, locals can enjoy California’s pristine beaches. The Bay Area’s beaches are well under a two-hour drive from both Stockton and Sacramento. From the mountains to the coast, these ideally located cities allow residents to enjoy all of California’s great outdoor recreation spots. Sacramento residents can enjoy top-notch art galleries, symphony performances, concerts, ballet and opera performances, and more. Downtown Sacramento is also full of public art. It is home to over 650 murals, and even holds an annual mural festival where visitors can watch the artists in action. Those interested in exploring the city’s history will appreciate a visit to Old Sacramento Waterfront. This 28-acre National Historic Landmark district has world-renowned museums, historic attractions, and charming shops and eateries. While Stockton is smaller than Sacramento, it still offers an impressive lineup of attractions. Downtown Stockton is a great place to explore while enjoying California’s sunny weather. The area has museums, one of California’s oldest farmers markets, music venues, and more. Stockton’s Miracle Mile is also a favorite spot for shopping, dining, and exploring eclectic cafes and bistros. In terms of active adult living, Sacramento and Stockton both have many options to fit different budgets. We're highlighting two here, but you can browse more on the Sacramento community page or Stockton community page. Buyers seeking a 55+ community near Stockton will find Woodbridge to be a great fit. This community is located about 20 minutes from Stockton and offers a small-town setting. It is home to 1,425 single family residences priced from the low $400s to the high $600s. Woodbridge residents enjoy access to a well-appointed clubhouse that offers 28,000 square feet of activities. It features an indoor pool and spa, fitness center and aerobics studio, indoor walking track, library, and an arts and crafts room. Outdoor amenities include a pool and spa, 18-hole putting green, multiple courts for tennis and other sports, a softball field, and more. There is also an outdoor amphitheater, fishing lake, and trails to explore the community’s grounds. Destinations at Vineyard Point is a great choice for buyers who’d prefer to live in Sacramento. This gated 55+ community has just 177 single-family homes, giving it a tight-knit atmosphere. Prices begin in the high $200s and reach the low $300s. The community’s clubhouse is the social and activity hub. Here, residents can stay active in the fitness center, refine their fitness efforts in the aerobics and dance studio, or celebrate community events in the gathering room. There is also a dance floor, catering kitchen, outdoor pool and spa, and sun deck.